The main event of UFC 205 features a rare fight between two reigning champions. Featherweight champion Conor McGregor challenges lightweight champion Eddie Alvarez for the 155-pound belt to cap off the first-ever UFC card held at Madison Square Garden. The two are evenly matched in several statistical categories, but there are key differences between the fighters that could end up deciding the bout this weekend. 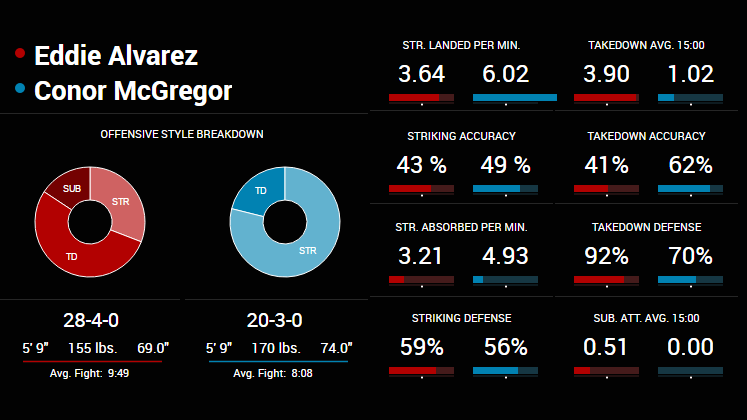 Neither Alvarez nor McGregor is strong in terms of defensive striking. In the UFC, Alvarez has allowed opponents to land 3.95 significant strikes per minute, while opponents are landing 4.93 per minute against McGregor. To put those numbers into perspective, they rank dead last among all ranked lightweights. On top of that, percentagewise, both fighters absorb a lot of strikes. Alvarez has only avoided 57 percent of opponents' strikes, and McGregor has avoided 56 percent. It’s remarkable that both fighters have managed such success without showing very much effective striking defense. They will most likely stick to the style that has brought them success, but a little defense tends to go a long way at the highest levels of the sport. On the other hand, McGregor more than makes up for his defensive liability with what he does on offense: He lands 6.02 significant strikes per minute, giving him a 1.09 striking differential. Alvarez was actually outstruck in his first three UFC fights before besting Rafael dos Anjos for the lightweight title, and his -0.55 striking differential in the UFC ranks last among ranked lightweights. The only other ranked lightweight with a negative striking differential is Michael Chiesa, who has won more than half of his fights via submission. Even though he is coming off a highlight-reel knockout, Alvarez will almost certainly need to close the distance and attempt to avoid extended periods of stand-up striking against McGregor. Over the course of his UFC career, Alvarez has attempted 34 takedowns and landed 10. After his promotional debut, in which he failed to land a takedown against Donald Cerrone, he has scored at least one per fight in his last three times out. McGregor would certainly prefer not to wrestle, but he also seems to have underrated takedown defense; he has stopped 70 percent of his opponents' attempts in the UFC, and he has only been taken down more than once, by Chad Mendes. Alvarez hasn’t always needed to land a takedown to effectively control a fight, as he often turns missed takedowns into opportunities to clinch and hold opponents against the cage. The result is a great deal of control time. In the UFC, he has spent more than 25 percent of his total 48:49 of fight time in control positions. Per the Unified Rules of MMA, Octagon control should only be considered if effective striking, grappling and aggressiveness are 100 percent equal. In each of Alvarez's UFC fights, his ability to control the action inside the Octagon clearly made an impact on the judges. Since McGregor is at his best while at a distance, Alvarez will most likely try to control the position of the fight. Mendes had some success with this strategy, but it might be tough to pull off for the entirety of a 25-minute fight.